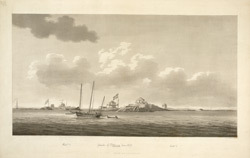 View of the Islands of St. Marcouf in the English Channel off the coast of France. These islands are a group of small islets situated in the Berry of Seine, between Caen and Cherbourg. They are named after St Marculf a French monk and missionary who lived in the 5th century. Every year he spent the period of Lent in solitude on one of these islets.